On October 6, Instagram turns eight years old. Since its launch in 2010, the platform has taken the world by storm. It seems like everyone — and their dog — is on the platform. Have you ever thought, I love scrolling through my personal feed, but I don’t know if my brand is a good fit for Instagram…? 80% of the app’s user base is outside the U.S.
of Instagram’s user base is outside the U.S.
It’s clear that Instagram isn’t just for personal use anymore. It’s now a global platform that allows brands to humanize their content, recruit new talent, showcase products, and inspire their audience. Instagram users aren’t just active, they’re engaged. This photo and video sharing app has quickly turned into a top social media site. More than half of the platform’s active users visit the site daily, and 35% say they check it multiple times a day. Instagram can also help you grow brand awareness and introduce products. 70% of Instagram users have spent time looking up a brand on the platform. Instagram allows you to promote your brand and product in a friendly, authentic way without hard selling to your customers. So, hopefully we’ve convinced to hop on the Instagram wave … but maybe you’re still unsure of how to get started. We know the platform can be a little intimidating at first, and that’s why we’ve created this guide. Read along or use the navigation in the header to jump ahead. Before we begin, it’s important to note that Instagram is intended for in-the-moment content. To stay relevant to your audience, you’ll need to invest the resources required to post regularly. Keep your profile up-to-date, and you’ll keep your followers around and engaged. 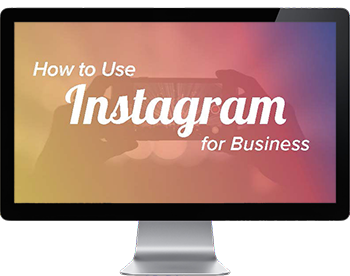 Below, we’ll dive into how to build and maintain a successful Instagram profile. If you don’t have it already, you can download the Instagram app from the App Store or Google Play Store. You can view content on Instagram’s website, but you can’t upload it via your desktop. You’ll need the app for that. When you open the Instagram app, you’ll have two choices for creating your account — Log In With Facebook or Sign Up With Phone or Email. Be sure to sign up with a business email so your Instagram profile isn’t linked to your personal Facebook account. Next, enter your account details. Under Full Name, enter your actual business name so your profile is recognizable to visitors. This name is what’s displayed on your profile; it isn’t your account username (or handle, for those Twitter folks). The Username is a name unique to your profile and allows other accounts to engage with your brand. 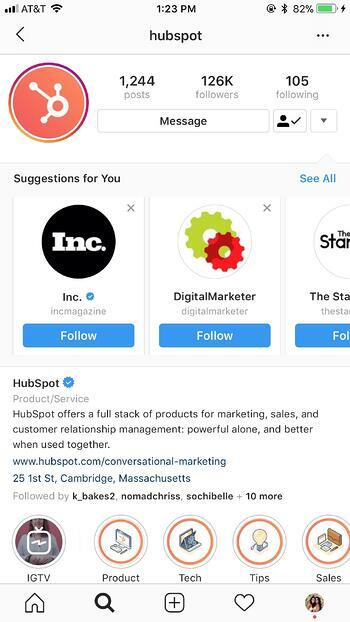 HubSpot’s username is @HubSpot. Pick a username that is recognizable and easy to find. If your business name is taken, try to keep the first part of your business name in your username. Note: You can update your username later in your account settings, so don’t worry if you want to change it in the future. Now it’s time to choose the right profile picture. Your profile picture is a big part of your first impression on new visitors. For this reason, keep your image consistent with your branding and visual markers. Consider using your logo or another familiar image. Instagram profile pictures are automatically cropped into a circle, so leave room around the corners of your image. Next up — your Instagram bio. Instagram bios have a 150-character maximum, so your goal here is a direct, concise summary of who you are and why people should follow you. Tell your audience about your business using a hint of personality. Instagram bios aren’t searchable, so don’t worry about keywords or hashtags (which we cover more below). In your bio, you can encourage users to take a specific action, such as using a certain hashtag or visiting your website. Your bio is the only place where you can feature a clickable URL and drive traffic to an external site. For this reason, it’s common for businesses to update their featured URL to align with their most recent post. If you decide to add a link, be sure use a link shortener like HubSpot's Tracking URL builder or a tool like Bitly or Goo.gl to keep your profile from looking cluttered. Tracked URLs also help you better understand the amount of traffic Instagram is driving to your website. For future edits, click on the Edit Profile button on your profile to change your photo, name, username, bio, and URL. In your settings, you’ll be able to do things like change your password, see posts you’ve liked, enable notifications, and much more. Here are a few things you should check out right away. 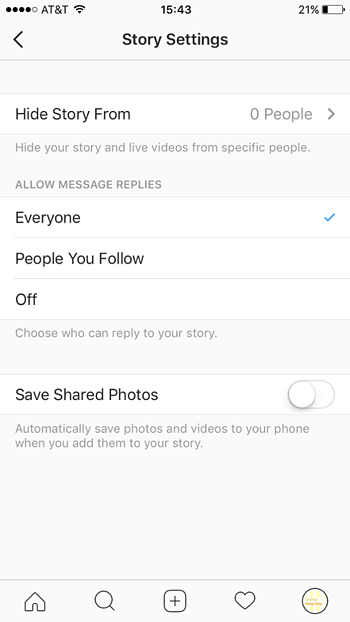 Story Settings, where you can manage who can see and reply to your Instagram Stories (which we discuss below). We recommend allowing all your followers to see and reply to your Stories to increase brand engagement. Switch to Business Profile, which allows you to identify your profile as a business profile. 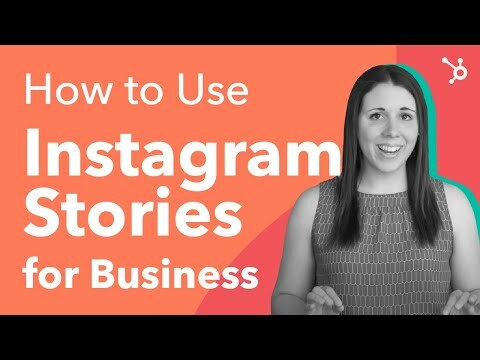 Instagram’s Business Tools feature makes it easy for users to contact you, provides you with in-depth insights, and allows you to promote your content. Note: Your business must have a Facebook business page to switch to an Instagram business profile. Private Account, where you can change your profile from public to private. Instagram will automatically set your profile to public — we don’t recommend changing it! As a business, you’ll want users to see your posts and follow your business without any obstacles. 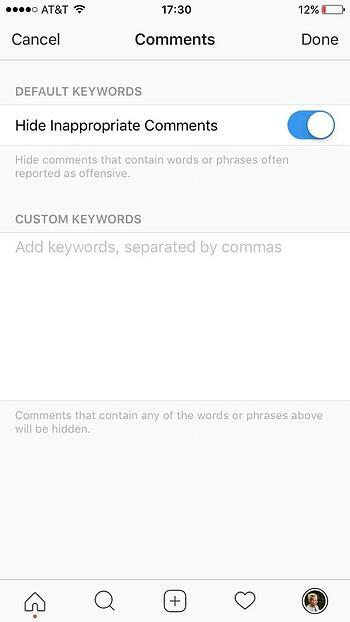 Comments, which allows you to hide comments with certain keywords or phrases. 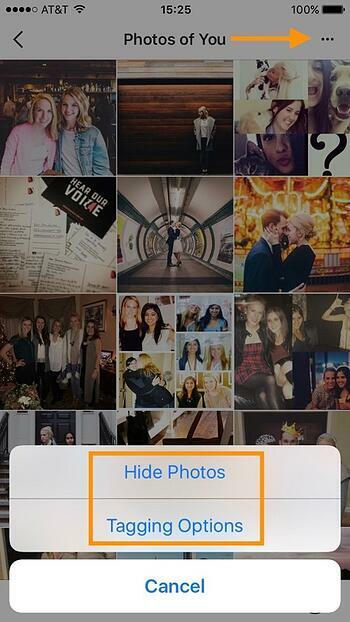 To do this, you must enter the specific words and phrases into your Instagram settings and turn on the feature. Receiving comments is exciting and encouraging, but certain comments may go against brand values or offend your audience. 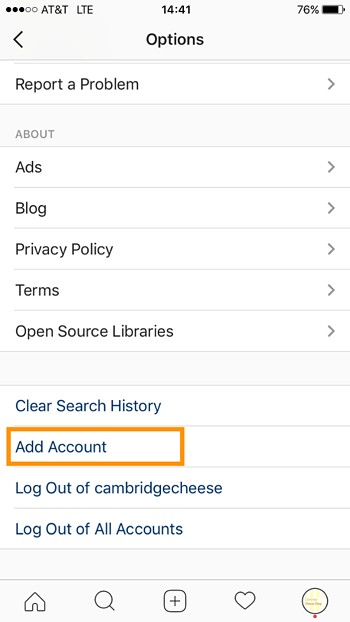 Adding Additional Instagram Accounts, where you can add up to five accounts and switch between them without logging in and out. This feature also allows you to have multiple people logged into an account at one time. To add an account, click Add Account. Enter the username and password of the account you’d like to add. To switch between accounts, go to your profile and tap your username at the top of the screen. Choose the account you’d like to switch to. Now that you’ve created your account, it’s time to start posting awesome content. Instagram allows you to post several types of content, including photos, videos, and Stories. Let’s talk about the different Instagram post types and some best practices for encouraging engagement. The most common post on Instagram is an image post. When posting images, it’s important to share a variety of photos. Variety will show your brand is diverse and engage your followers in different ways. It’s also important to remember that Instagram users are looking for genuine posts from brands, not blatant advertisements. Try to capture your company culture with lifestyle shots and behind-the-scenes looks. Avoid posting too many photos of your product. 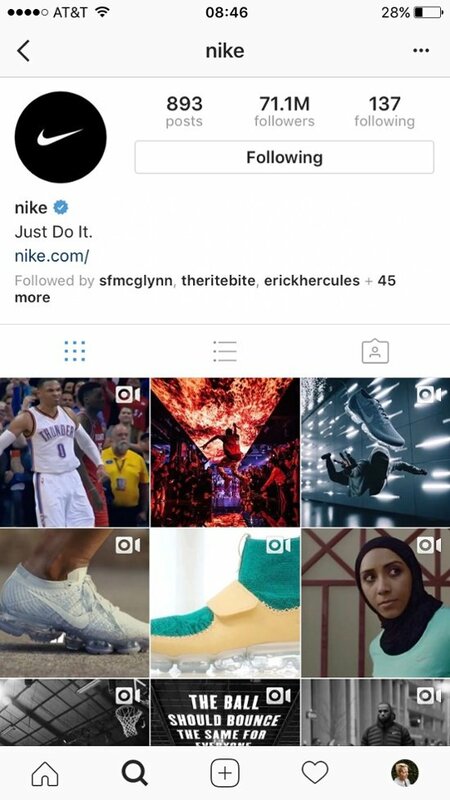 A good example is Nike’s Instagram. It includes product photos, but the majority show athletes, concerts, and other types of content that promote the Nike brand personality as a whole. As you start to explore the platform, you’ll see there are countless kinds of images you can post to your account. Get creative! Take note of any concepts or styles you think would work well for your brand. To get you started, we’ve compiled a list of some successful Instagram image types. These posts offer a glimpse into the part of your business that people don’t normally see. It’s important that they don’t look staged — authenticity is key! Example: Aeronaut Brewing Company provided an inside look at its company culture by showcasing its employees at work. 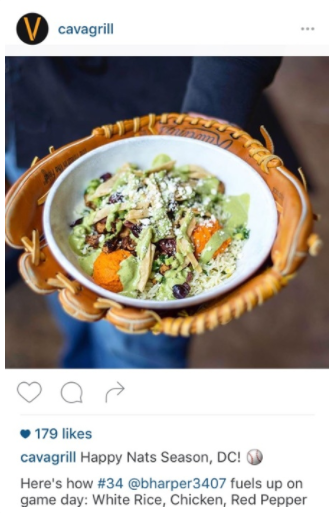 Great content can be right in front of you … on your employees’ Instagrams. (Just be sure to tag or credit the original poster.) Reposting photos from your employees is an easy way to curate authentic content and humanize your business. Not only will your audience engage with your brand, but they’ll also start to “bond” with your employees. 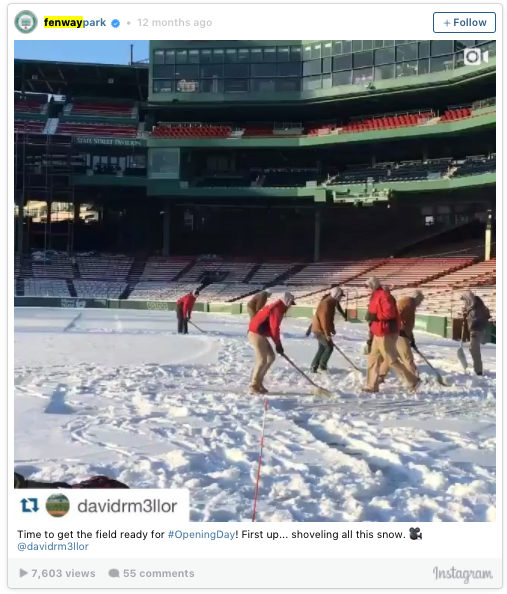 Example: Fenway Park often reposts images shared by the grounds crew as they prepare the stadium. Educational posts offer snackable tips on how to do or make something. The photos or videos usually present the instructions in a way that are quick and easy to follow. Example: The popular Tasty recipe video series from Buzzfeed is educational yet very entertaining and easy to replicate. Influencer posts use the fame of a celebrity or well-known public figure to promote your brand. These posts often include a visual of the influencer using or interacting with your product. One of the main benefits of influencer posts is gaining the attention of another audience. 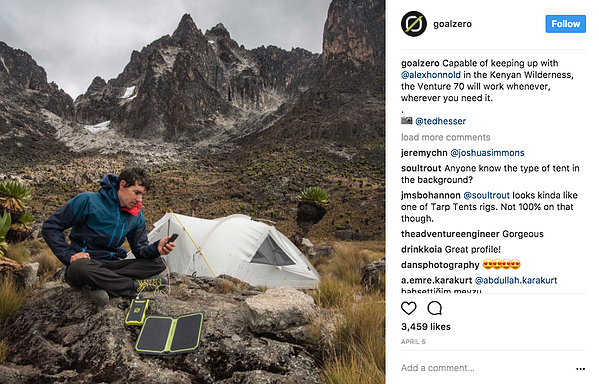 Example: Goal Zero shows renowned rock climber and photographer Alex Honnold using one of its solar power charging stations. Not only is Goal Zero reaching its own audience, it's also reaching Alex’s 500,000-plus Instagram follower base. A motivational post combines a simple visual with an overlaid quote or uplifting text. These posts encourage your audience and amplify your brand values. While effective, try to post these sparingly to avoid looking cheesy. Apps like Quipio and Typic can help you add text to photos in a way that’s consistent with your brand guidelines. 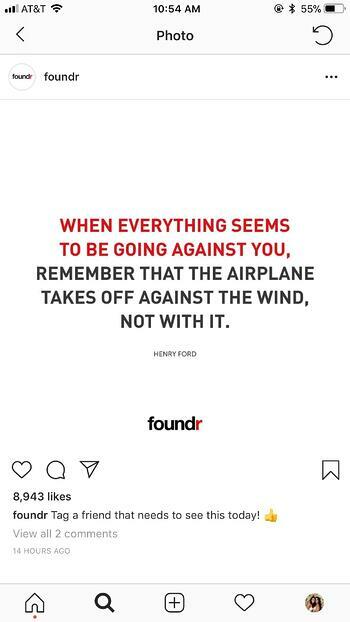 Example: Foundr often shares motivational posts to encourage its follower base of entrepreneurs, small business owners, and marketers. The posts also align with their mission as a business media company. Similar to employee reposts, user-generated content (UGC) is curated content from your fans and followers. Your tagged posts and posts with your brand hashtag are a great source for UGC. Sharing your fans’ and followers’ photos not only make the original poster feel good, it also shows that you truly care about your customers. Just be sure to credit the original post with a tag or in the caption. 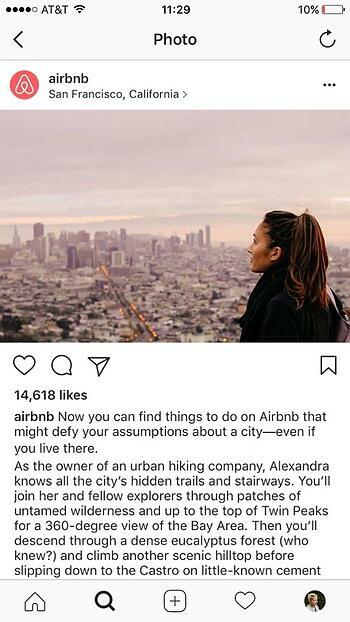 To repost user-generated content, screenshot and crop the original post or use a reposting app like Repost for Instagram. 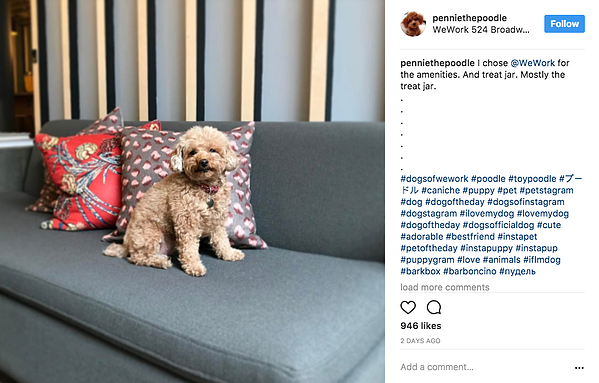 Example: WeWork conducts an annual #DogsOfWeWork campaign and compiles the best submissions together into a yearly calendar. 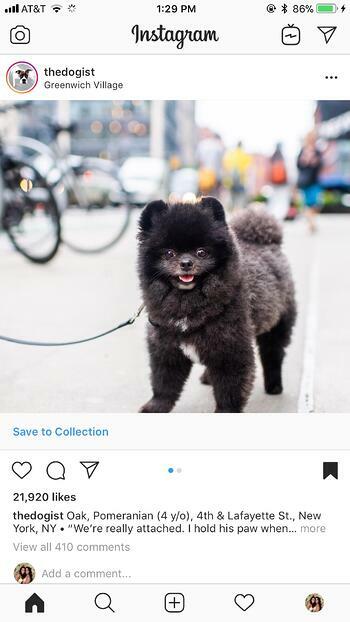 Although WeWork doesn’t repost every tagged image, their campaign helps create invaluable reach and engagement. It seems like there’s a “holiday” for everything these days. Events like National Sibling Day and National Ice Cream Day generate a ton of engagement on social media. Join in the fun by participating in a local, national, or world trend. A newsjacking post is a great way to post humorous content that relates to light-hearted events. Example: Cava Mezze Grill celebrated The National’s Opening Day. Through this post, the American restaurant chain tapped into a popular American pastime. Now that we’ve explored what you can post on Instagram, let’s review some ways to make sure your content is successful. Unlike other social media platforms, Instagram’s simple profile layout forces you to focus on the quality of content … not the quantity. While this is great for engagement, it also means that you can’t hide mediocre content. As a result, it’s important to use high resolution images on your Instagram feed. Square images should be 1080 x 1080px. Landscape images should be 1080 x 566px, and profile images should be 1350 x 1080px. Regardless of what size you upload, every image will be shown as a square in your profile feed. You might be thinking How am I supposed to capture the perfect, high-quality shot without a high-quality camera...? No worries! Phone camera technology has become so advanced that it now rivals thousand-dollar cameras. Amazing photography is no longer limited to those with professional cameras. You (yes, you!) can take eye-catching photos your audience will love using a tool you already have in your hands. Here are some tips to drive follower growth and Instagram engagement. To instantly improve your photo composition, turn on your camera grid lines. Aim to place your subject at the intersection of one set of vertical and horizontal lines. This technique, known as the rule of thirds, is popular among painters, illustrators, and photographers. Placing your subject off center creates a slight imbalance that catches your viewer’s eye. To turn on your grid lines (on an iPhone), go to Settings > Photos & Camera and switch Grid to on. It’s sometimes said that a photographer’s job is to create simplicity from chaos. A crowded background with multiple subjects in a frame only distracts from the focus of your shot. It can even confuse your audience. Instead, focus on a single subject in each photo. Remove distractions by cropping them out or finding a clean background to shoot against. Negative space is the empty space around your subject. Leaving negative space around your subject will draw attention to the desired focus of your image and prevent it from looking crowded. People are used to seeing the world from eye level. 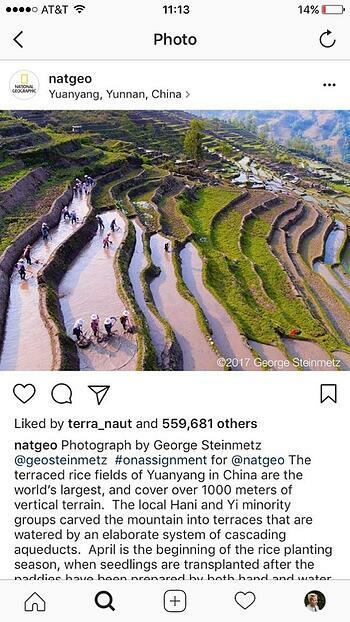 To create interesting and fresh photos, National Geographic photographers commonly use shots from different perspectives. Change up your shooting perspective to capture a bird’s eye view or worm’s eye view. Experiment with different angles to find new perspectives on common sights. The human eye is naturally drawn to symmetrical shapes and objects. Sometimes, it’s best to break the rule of thirds and center the scene in your frame. Leading lines are another more specific form of symmetry that pulls the eye into the photo. People are also drawn to patterns. A pattern could be man made, such as a tiled floor, or natural, such as petals on a flower or vines on a wall. To make things really interesting, break up the pattern with your subject. Standard overhead lighting creates harsh shadows and highlights that create unwanted dark and light areas in your photos. To prevent this from happening, use soft natural light wherever possible. Try taking photos next to a window , and for outdoor shots, the half-hour just before sunset and after sunrise often offers the most striking lighting as the sun is low in the horizon. Ever wonder why some photos just look so good? It probably has to do with how it’s edited. Editing photos only takes a few minutes and can massively impact the quality. 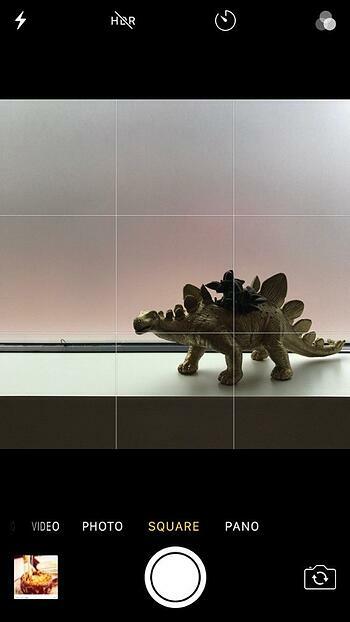 Thanks to Instagram’s built-in tools and filters, editing photos is very simple. Follow these tips to make that photo of your homemade lunch look like a culinary masterpiece. First, start with a great photo (using our tips above). No amount of editing can fix photos if they have poor composition or lighting. 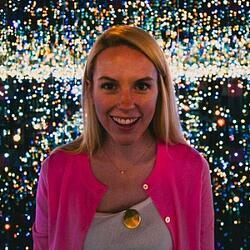 Consider using other apps to edit your photo. Snapseed is a free editing app that allows you to apply effects like HDR and tonal contrast as well as adjust brightness, contrast, and saturation. VSCO is also another popular editing app with numerous free filters that resemble popular film stocks. (When you upload your edited photo to Instagram, it’ll automatically crop your photo into a square. To change it back to the original width, press the icon the two outward facing arrows.) 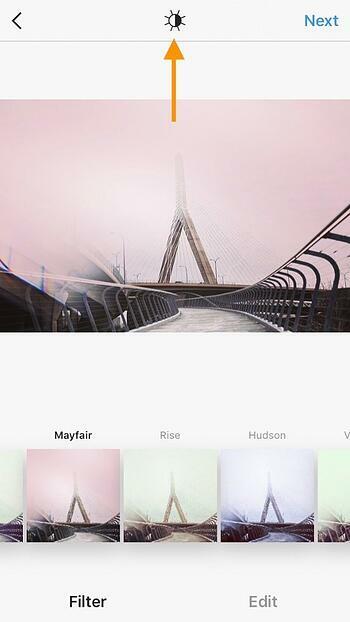 At this stage, you can add additional Instagram filters — but don’t go too crazy. Each Instagram filter has its own personality that can drastically change a photo. Next, try adjusting your photo lux. 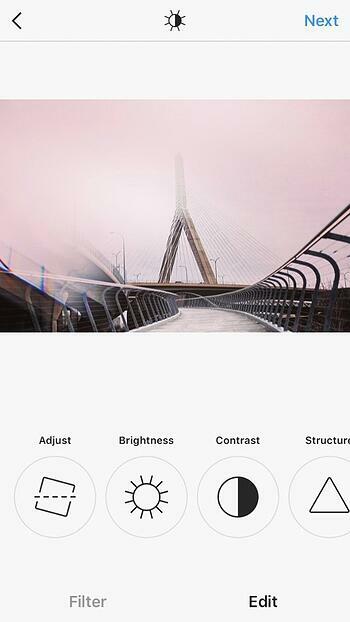 According to Instagram, “Lux balances the exposure and provides much needed brightness” to photos. Lux make can make your image more vibrant and bring out details. To do this, press the sun icon at the top of the screen and adjust the level. Make any final tweaks using Instagram’s editing tools. Press Edit to adjust your photo’s alignment, brightness, contrast, structure, and more. Press Next when you’re done to add final details and publish. 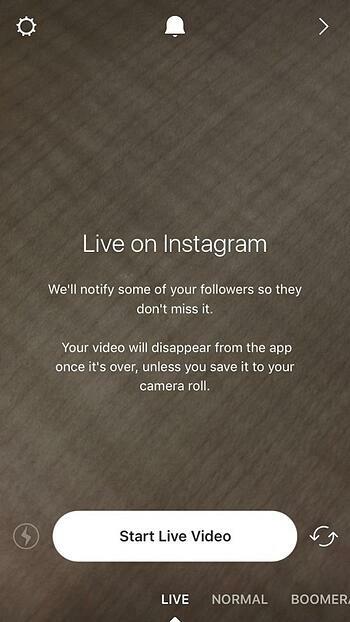 Instagram also lets you upload videos, as long as they’re a minute or less in length. You can download professionally edited videos from your computer or videos you’ve edited in a mobile app. Splice is a free editing tool (from the same guys that made GoPro) that allows you to cut together multiple clips and add transitions, titles, and music. Instagram videos default to playing without sound. Because of this, make sure at least the first few seconds of your videos don’t need sound to be understood. You can use your caption or prompt viewers to turn on the sound. Example: Purina shared this video that delights viewers with cute dogs. Open your Instagram and tap the camera icon in the top left-hand corner of the home screen. This is the in-app camera. You can also access this by swiping right on the screen. Boomerangs allow you to put a quirky spin on traditional video. Boomerangs created using a burst of photos and stitching them together for a short, repetitive video. These kinds of posts are fun for circumstances like jumping, toasting glasses, or high-fiving. You can also download Instagram’s Boomerang app to have a separate place to capture boomerang videos. Do you have a video that’s too long for Instagram? Check out Hyperlapse! Hyperlapse from Instagram allows you to condense lengthy videos into shorter, post-able content. It creates smooth, time lapse videos with built-in stabilization. To create your own Hyperlapse videos, download the app and give it to access your camera. Tap the circle once to stop and start your recordings. Once you’re done recording, you can choose a playback speed between 1x and 12x. Save the final Hyperlapse video to your camera roll to upload later. Instagram Stories allow users to post at a higher frequency without overposting and clogging up your main feed. Stories usually feature less-polished, more organic images and videos. Like Snapchat Stories, your Instagram Story disappears after 24 hours. Stories are all about authenticity. While your Instagram feed should feature polished photos, Stories can be a little more raw. Use the feature to give a behind-the-scenes look at your brand or showcase your company culture. Do you have dog-friendly office? Share photos and videos of the dogs on your Story. Stories are also a helpful tool to showcase live events your business hosts or attends, as this feature is much more time-sensitive. 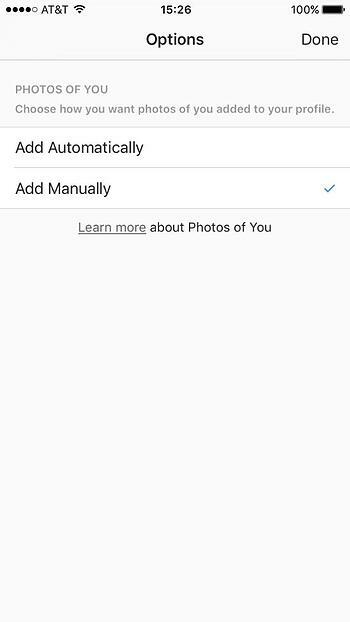 Instagram offers three options for posting to your Story. You can tap the camera in the upper left, tap Your Story + above your feed, or just swipe right to access the camera. Let’s review the other camera settings that we didn’t cover above. Like your typical phone camera, the thunderbolt icon controls the flash and the arrow icon switches the camera view between front and forward-facing. Stories make it easy to add personality to your content! Swipe to the left or right to access the filters. Select the pen icon to choose a color and add a doodle. Press the Aa icon add text with your keyboard. The smile icon allows you to add a location, GIF, music, poll, and many more fun features. Instagram also allows you to tag another account in your Story, which is a great way to connect with other businesses and your followers. To tag someone, type the “@” followed by the username you’d like to mention. This makes the tag clickable so that viewers can visit the tagging profile. You’ll receive a notification if you’ve been mentioned in someone’s story. When you’re ready to publish, press the Your Story + icon or save it to your camera roll to publish later. 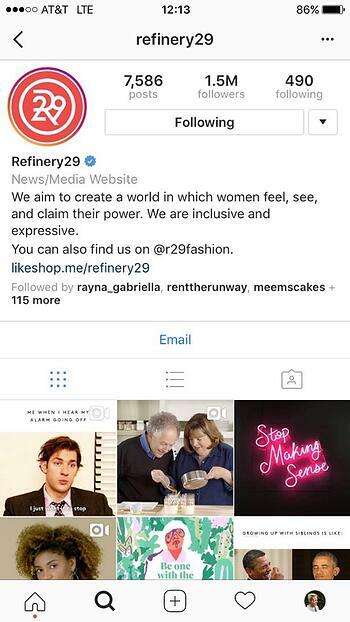 Stories appear at the top of the Instagram feed and through your profile picture. To see who viewed your content, swipe up when viewing your Story. As we talked about above, Instagram has a live video option that allows you to share content real time. To start a live video stream, open the Instagram camera, swipe to the Live setting, and click the button to Start Live Video. Once you start the live video, any followers currently on the app will receive a notification that you’re live. Live viewers can also comment on the the live video using the built-in chat feature. Live video should be used sparingly to showcase exciting, real-time content or engaging moments like Q&As or reveals. Instagram TV, or IGTV, is Instagram’s newest video offering. Available to watch through the Instagram app or the standalone IGTV app, users can view long-form, vertical video from Instagram creators. 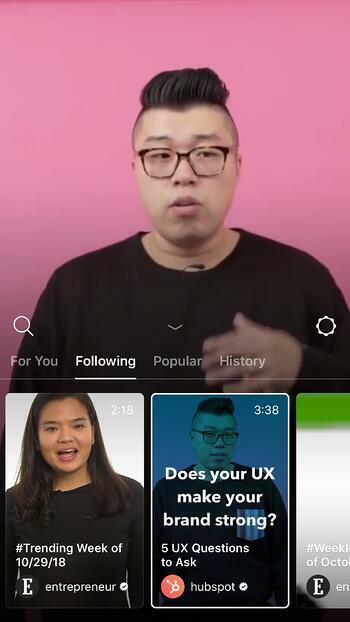 Think: Cooking videos, interviews with celebrities, product reviews and tutorials ... this is the content you’ll typically find on IGTV. What's the difference between Instagram Live and IGTV? IGTV is uploaded footage, which gives users the opportunity to edit and fine-tune their video. Instagram Live is filmed and uploaded live. To begin posting, download the IGTV app, create a channel, and upload a video between 15 seconds and 10 minutes in length. Verified accounts can run videos up to an hour long. At this time, IGTV videos can only be viewed on mobile devices using the Instagram or IGTV app — the platform does not support desktop viewing. Learn how to get followers, build your audience, set goals, and measure success. 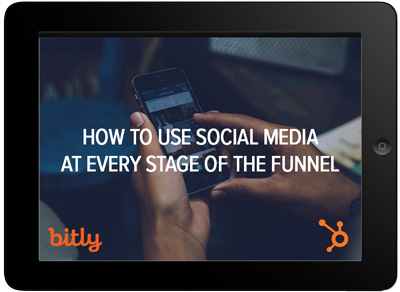 Use social media to attract, convert, close, and delight your customers. 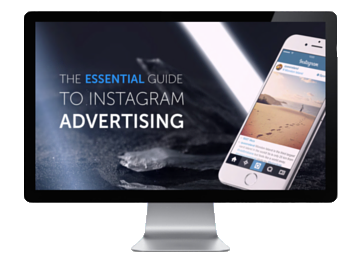 Learn how to run Instagram ads, define goals, moderate engagement, and measure success. One picture may be worth a thousand words, but there’s something to be said about the context words bring. Writing remarkable captions can be tough, and that’s why we’ve come up with some tips to relieve some of that pressure. Writing several drafts and ask your friends or co-workers for their opinion. Yes, your content should be timely, but it should also be engaging. 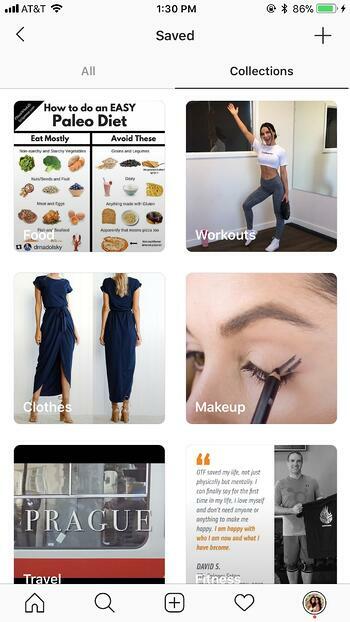 Instagram recently changed its algorithm to organize each user’s feed to show what they’ll likely find engaging. The visibility of each post will depend on the number of likes and comments it receives. Take the time to create content that will delight and engage your customers. Your captions can be up to 2,200 characters. (For comparison, Twitter allows 140.) Regardless of length, users can only see the first 3 to 4 lines of each caption. They have to click More… to see the rest. Because of this, put the most important content at the beginning of the caption so it’s always visible. That being said, don’t shy away from long captions. In fact, Instagram can be a great storytelling medium. For example, Humans of New York writes longer captions with quotes from the people they photograph. 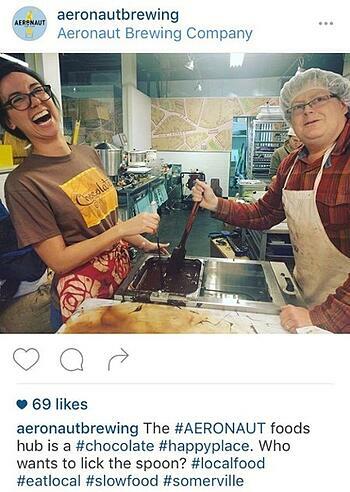 Always include a call-to-action in your caption. Encourage your audience to like, comment on, and share your photo. You can also use your caption to direct people to your bio link, where they can check out a new product or blog post. Just remember to change the link so it corresponds with your most recent post. 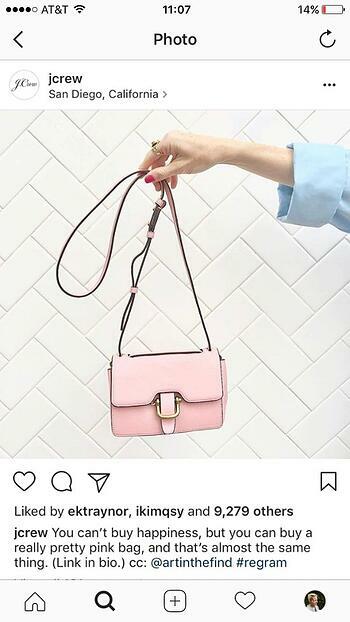 Tip: Use shortened tracking links in your URL so you can see how much traffic came from your Instagram account or a specific post. Include a geotag. Did you know that posts tagged with a location see 79% higher engagement? Adding a geotag gives users another way to find your content, which can lead to higher engagement. Every social platform has a distinct voice. What works Twitter may not work on Instagram. On Instagram, posts with a lighthearted, authentic tone tend to perform the best. Experiment with emojis and other fun tools to give your brand a distinct feel. Don’t expect to get it right the first time — it can take a while to develop your brand’s voice. If you’re ever in doubt about what to write, keep it short. 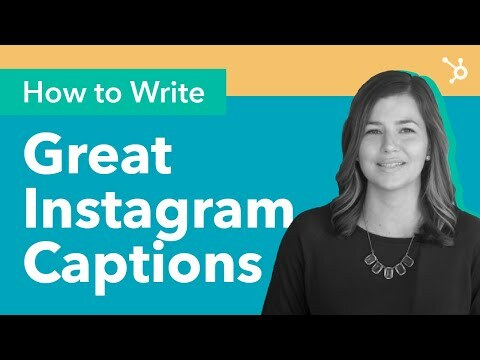 There’s little correlation between caption length and engagement, but short captions allow your visuals do the talking. Hashtags have taken over the internet. Hashtags refer to keywords or keyword phrases that are spelled without spaces and prefaced with a pound (#) sign. They are generally used to reference events, conferences, pop culture, entertainment, or reoccurring themes and are a great way to make your content more visible. Originally popularized by Twitter, hashtags are now on multiple social networks. Instagram feeds are always changing, which makes sense considering that 80 million photos are shared everyday. With that much content, it can be difficult for your account to get noticed. That’s where hashtags come in handy. 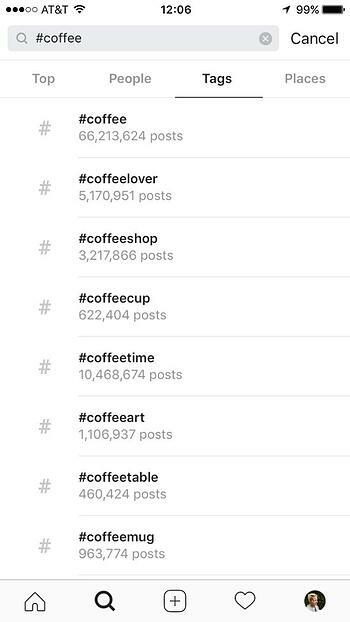 On Instagram, hashtags aggregate posts from a wide variety of users into a single feed … although only public accounts can be shown when searching hashtags. 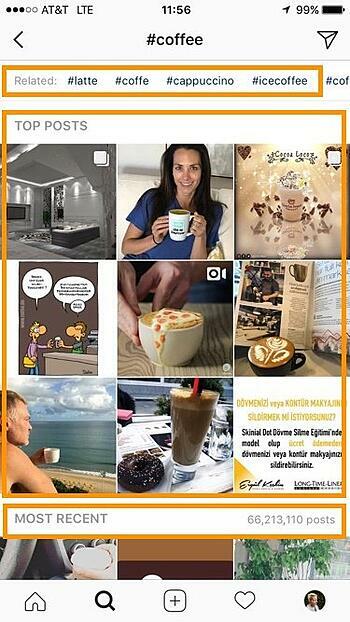 For example, if you’re planning on tagging your post with #coffee, you may want to tag related hashtags like #latte, #cappuccino, #icedcoffee, or #coffeebreak to broaden your post reach. Using hashtags is easy! Simply create hashtags using characters, numbers, or emojis; you can add up to thirty to the caption. Just remember — your account must be public for your posts to appear on hashtag feeds. How do you choose which hashtags are best for each post? Our best answer is by brainstorming related keywords and researching relevant trends, which is actually easiest within Instagram itself. Start in the Explore tab (the magnifying glass icon on the bottom menu). There, you’ll find popular posts and see what hashtags were used. If you already have a hashtag in mind, you can also use this page to find popular, related hashtags. Just type the hashtag in the search bar, and filter your results by Tags to see how many posts have used that hashtag as well as other related hashtags. Try to blend general, trending hashtags and specific hashtags to increase your post reach and relevance. Also, consider creating your own branded hashtag. Many businesses use their own hashtags to roll out a new product, manage an Instagram campaign, promote an event, and collect user-generated content. If you’d like to do this for your business, make sure yours isn’t being used for another purpose … and then encourage your audience to use it! Now, let’s discuss how to incorporate hashtags in your content. First and foremost, don’t be spammy. Hashtags should be natural in your caption. Most businesses use 2.5 hashtags per post. 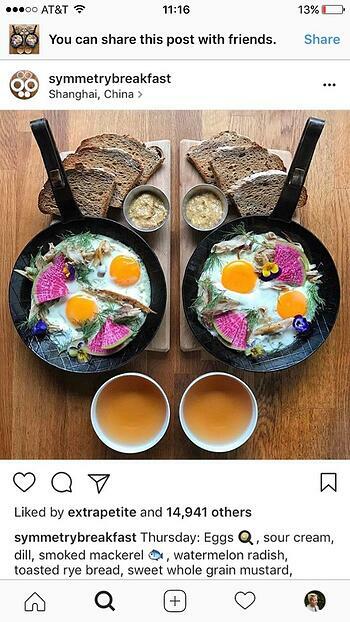 Aim to use one to four hashtags to avoid overwhelming your audience and making your captions hard to read. If your hashtags don’t naturally blend into your caption, tack them onto the end or even in the first comment. They’ll work the same no matter where they’re placed. Many businesses feel pressured to be present on every social media platform … and they forget about strategy. Don’t make this mistake. Since Instagram is very different from other popular social sites, it requires a distinct marketing strategy. Start here to develop your brand’s own unique style. Determine the audience you want to reach before you begin marketing on Instagram. If you have other marketing strategies in place, draw from those to keep your efforts consistent. Don’t forget to consider factors like age, location, gender, income, interests, motivations, and pain points. Don’t know where to start? Monitor popular event and interest hashtags related to your business. See who’s using and engaging with these hashtags and check out their profiles. You can also take a look at your competitor’s followers. Instagram makes it easy to define your audience. After you determine your Instagram audience, do a competitive analysis to see what other marketers in your field are posting. If you already know your top competitors, start by reviewing their Instagram profiles. If not, search for terms related to your business and industry to find similar accounts. 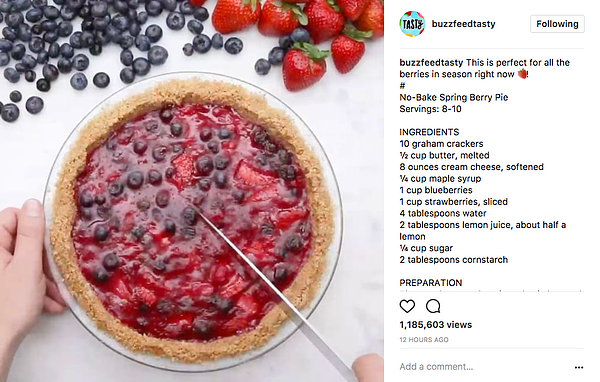 Conduct a quick audit of related accounts to see what posts are getting the highest engagement, what popular hashtags they’re using, what their captions are, how often they post, and how quickly they’re growing. This information can serve as a benchmark as you start growing your own account. While auditing your competitors’ content, take note of any opportunities they might’ve missed. Adding unique content into the mix will help your business to stand out from the rest. On average, brands post about six images per week on Instagram … which is over 300 posts per year! At that frequency, it can be difficult to keep track what you need to post and what’s already posted. 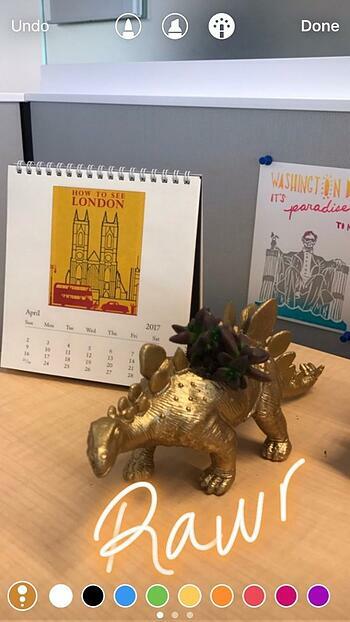 Creating an editorial calendar can help you save time and manage your Instagram presence. Fill in your calendar with some Instagram post types discussed earlier and plan your captions, hashtags, and posting times in advance. Your editorial calendar is also a great place to record any key events to highlight on your Instagram account, such as new product launches or special offers. With an editorial calendar, you can keep an eye out for real-time opportunities instead of scrambling for last-minute posts. Random or disjointed content confuses your audience and can cause you to lose followers. To prevent this, maintain a consistent brand aesthetic on your Instagram account. Determine what this looks like by thinking about your brand personality. What are your brand values? How would your customers and employees define your brand? Are you bold, playful, gritty, or adventurous? 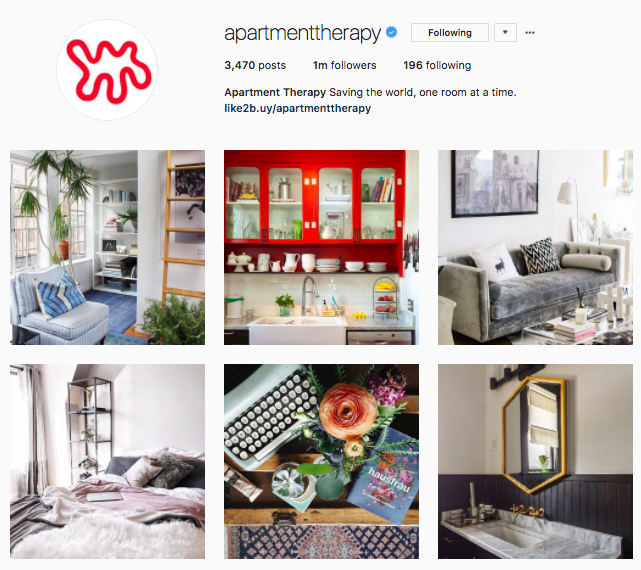 Apartment Therapy's brand personality is bright, clean, and organized, and its account reflects all three of those traits. Ideally, brand aesthetic helps your brand become recognizable, meaning someone could see your picture in their feed and instantly know it’s yours … without seeing the name. Taco Bell is another great example of brand aesthetic. Its feed focuses on the bold, on-the-go lifestyle of its millennial audience and features fun images to drive engagement. Once you determine your brand personality, refine your content to match. This can even apply to the color palette used in your photos. Brand aesthetic doesn’t just apply to visuals. Aim to post images with your brand narrative in mind, too. Including compelling stories in your captions can make your brand more relatable. 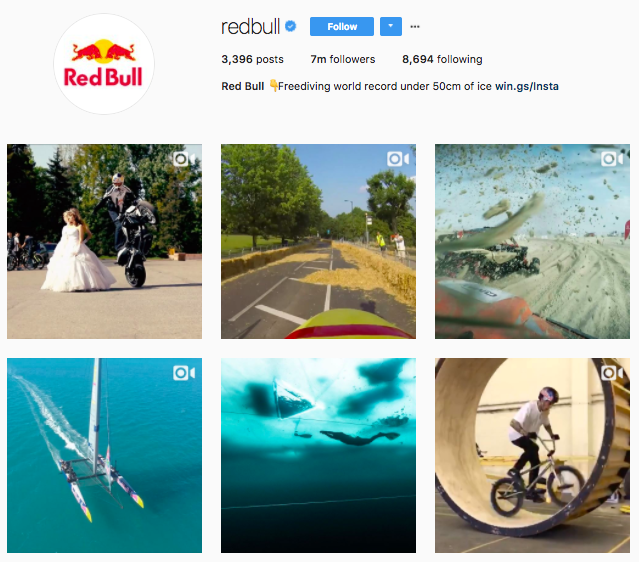 For example, Red Bull’s feed features plenty of high-energy images and videos that add to its brand’s story. Once you establish a dedicated follower base, you can start converting those followers into paying customers. Here are some strategies. Promotions. Deals, discounts, BOGOs, and other offerings are a great way to drive first-time sales with your Instagram audience. Be sure to include what your followers need to do to receive the offer, and mention a deadline to create a sense of urgency. Contests. What better way to make someone a customer than by letting them try your product? Run contests that require someone to follow your account or post with a hashtag to enter. 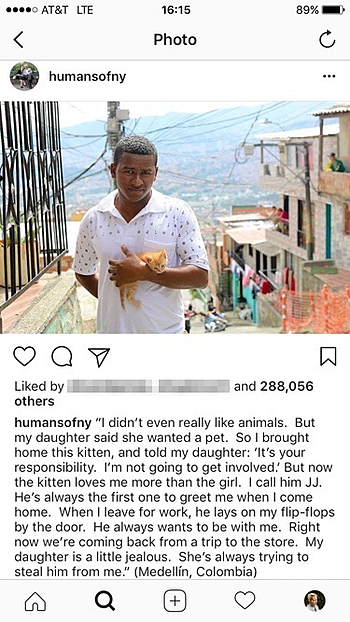 Charity. 81% of millennials expect companies to make a public commitment to charity. Doing so can build affinity for your brand and help turn followers into customers. For example, Gap partnered with The Global Fund to help fight AIDS in Africa. Since 2006, it has helped raise over $130 million. Teasers. Instagram is a great platform to show your audience glimpses of new products before they’re available. While you don’t want to spam your followers’ feeds with only product photos, a few images can build excitement. Live launches. Consider showcasing a new product or service using Instagram Live. Then, drive users to purchase by including a purchase link in your bio. ther you’re an established business with thousands of followers or you’re just starting on Instagram, growing your following takes serious time and energy. You may be tempted to take the easy way out and buy followers … don’t do this! Purchasing followers won’t actually drive engagement, which is really what you need to ensure your posts are being seen. Here’s what you can focus on to build a following the right way. Make sure your username is recognizable and searchable. If people can’t find you, they can’t follow you! Fill out your bio. It’s the last thing someone sees before they make the decision to follow you so be sure to include who you are and what you do. Once your profile is optimized, start posting. It’s a good idea to populate your feed with ten to 15 high-quality posts before you really start engaging people. If users visit your profile and find it empty, they probably won’t follow you. Then, start following accounts that interest you and relate to your business. Think of Instagram like a community and look for other businesses in your area or influencers who might enjoy your product or service. As you follow accounts, Instagram will suggest related ones that you can follow, too. After you follow an account, interact with their content. This is the most natural way to draw attention to your own Instagram account without being spammy. When you follow or interact with an account, the account owner will get a notification. This could prompt them to check out your account and start following you. Always appreciate your followers by responding to their comments and engaging with their content. Next, encourage others to share your content. Invite brand ambassadors to share your account or collaborate with similar accounts. Lastly, be sure to promote your Instagram on other channels. Include an Instagram social share button on your website and share your Instagram on other social platforms. Sometimes the fastest way to gain more followers is to simply ask for them! 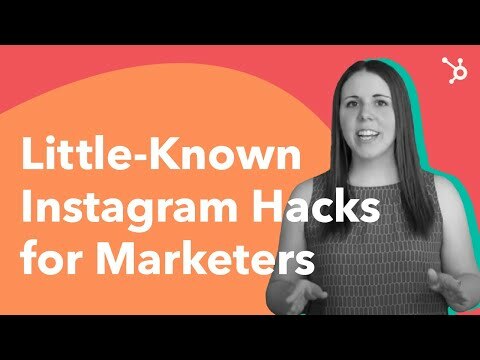 Let’s explore a few little-known Instagram hacks to make the most of the platform. We recommend downloading the latest version of the app to follow along. Instagram users are active at all times of the day. However, there are a handful of optimal times to post on Instagram. For peak engagement, the best times to post are Mondays and Thursdays at any time except between 3:00 p.m. and 4:00 p.m. This is for the time zone of your target audience. Many users tend to engage with more content during off-work hours on weekdays. One thing that makes Instagram unique is that you can share your content seamlessly across other social networks. We don’t recommend automatically linking to your other social platforms like Twitter and Facebook; what works on Instagram won’t always yield the same results on other channels, especially as you get up and running. It’s important to tailor your content to each platform. However, linking your Instagram to your other social accounts like Facebook does increase the number of eyes on your posts. 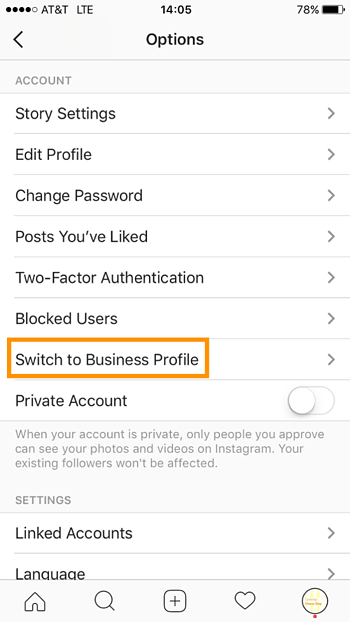 Remember, your Facebook Page will already be linked to your Instagram if you set up an Instagram business profile. 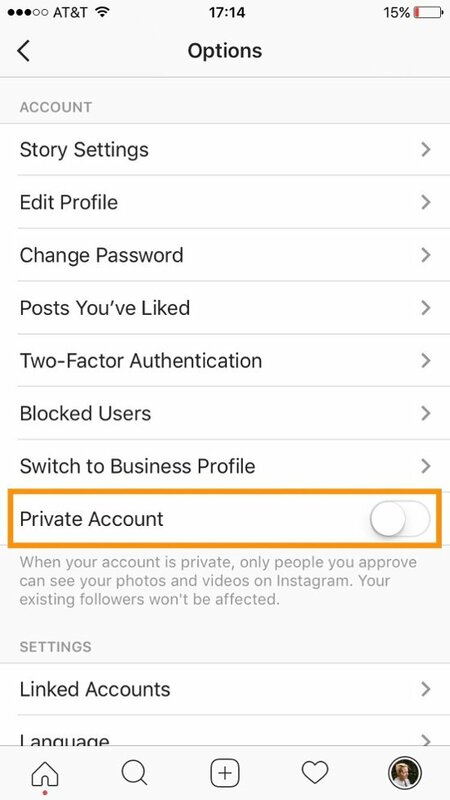 If you do decide to do this, go to your Instagram settings and click Linked Accounts under Privacy and Security. Log into Facebook and pick the Facebook Business Page to which you’d like to link. Next, under the Share Settings menu, the Facebook logo should be blue to indicate that sharing is on. 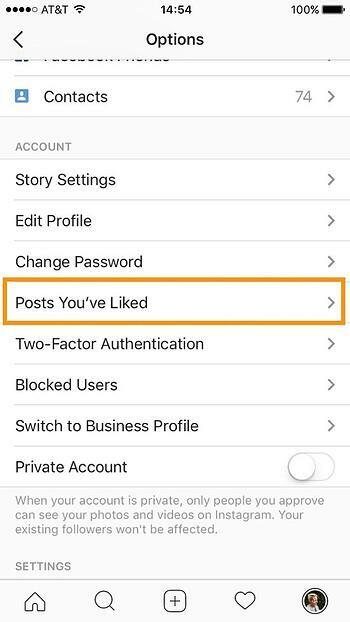 You can see all the posts you’ve Liked in your Instagram settings menu. Simply click Posts You’ve Liked under the Account section. To maximize productivity, Instagram lets you reorder filters to position the ones you use most often at the beginning. 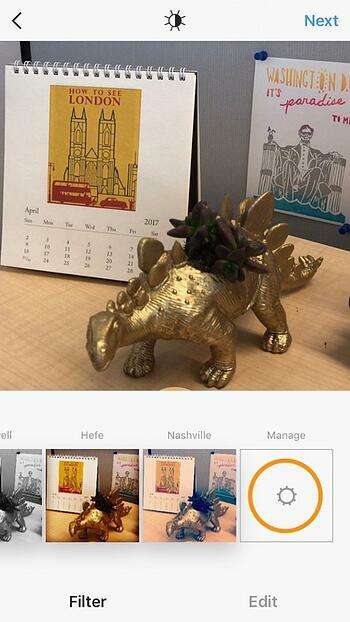 To reorder or hide filters, open the Instagram editor. Scroll to the far right and click the Manage gear icon. Hold down the three gray lines to reorder the filters, or uncheck to hide it. When you write a caption on Instagram, the keyboard removes the “return” button. To reveal the button, press the “123” button, and it’ll pop back up on your keyboard. Remember, Instagram only shows the first three lines in a caption, so use the “return” key sparingly. If someone tags you in a post, it’ll show up when you click person icon in the menu under your Instagram bio. Your followers can see this, too. 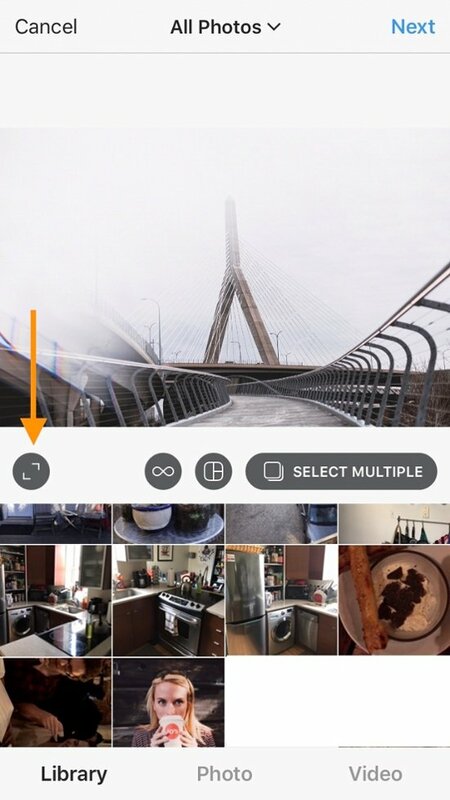 To hide a tagged post from this menu, click the three dots in the top right corner and choose Hide Photos. Select the posts you want to remove and click Hide Photos again. This won’t remove the posts from Instagram, but it’ll remove them from your profile. If you don’t want to have to continually check and remove tagged posts, you can manually choose just to include the ones you do like. Click the three dots and press Tagging Options. You can then choose to Add Manually. Moving forward, you’ll be notified when someone tags you in a photo. When that happens, tap on the photo you were tagged in and choose Show on Profile. There’s lots of incredible content on Instagram. Maybe you’ve seen content by competitors that you want to emulate, or maybe you’ve found some user-generated content you’d like to repost. How can you save this content to access later? Well, Instagram makes it easy — through Saved content. On your Instagram feed, you can like, comment, and message posts. You can also save them, using the ribbon icon in the right corner. When you tap it, you’ll see Save to Collection pop up along the bottom of the post. If the image or video you’ve saved falls into a collection, such as UGC content or inspiration, you can create a collection for that content. 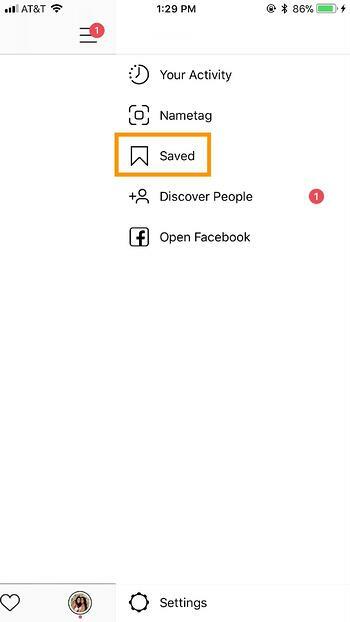 Access your Saved content through your profile. Tap the three horizontal lines in the top right-hand corner and click Saved at the top of the list. Under All, you’ll see all your saved content in chronological order. Under Collections, you’ll find that content organized into Collections. Instagram doesn't have an built-in, in-depth analytics platform like Facebook … yet. When you switch to a Business Account, you do gain access to some limited analytics, such as follower growth, impressions, reach, and engagement. Access these by clicking on the View Insights option below your uploaded images and videos. You can also track Instagram impressions, spend, and engagement on ad campaigns through Facebook’s Ad Manager. While helpful, these metrics are limited to individual posts and campaigns. You can access more in-depth Instagram metrics using third-party apps. Iconosquare and Simply Measured allow you to track additional metrics such as followers and engagement over time, optimal post time based on previous posts, and performance compared to selected competitors. Although both platforms require you to pay to use them, you can start with a free trial to see if their analytics offerings are right for you. The individual metrics you track on Instagram will vary depending on your goals, but you should always keep an eye on engagement (likes and comments) and your number of followers over time. If you’re posting valuable content, your account will steadily gain followers and engagement. Whether or not you have the budget for more in-depth analytics tools, it’s important to track these basic metrics to make sure your account is growing and performing well. 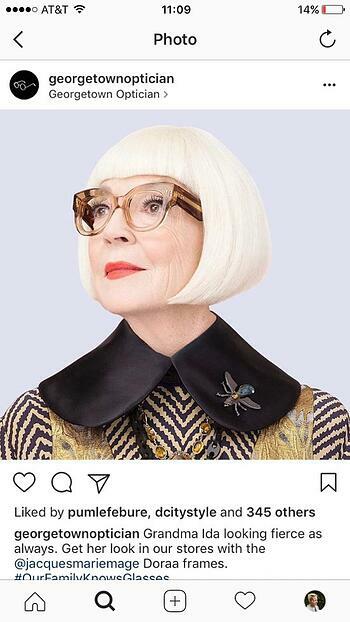 Let’s discuss Instagram advertising. 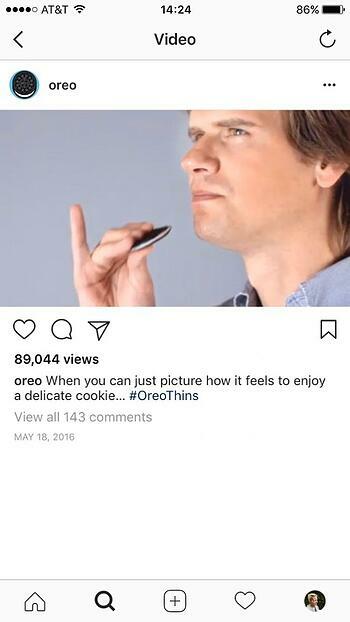 Instagram advertising offers a unique opportunity for brands to engage with their audience. 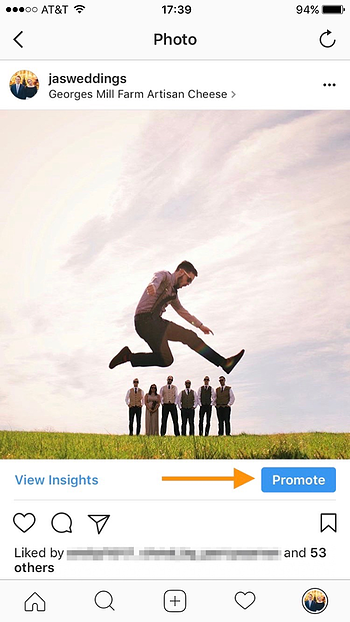 Since Instagram ads appear in feeds like any other post, they aren’t as obvious or disruptive as typical ads. They provide a natural way to encourage users to learn more about your business or product. 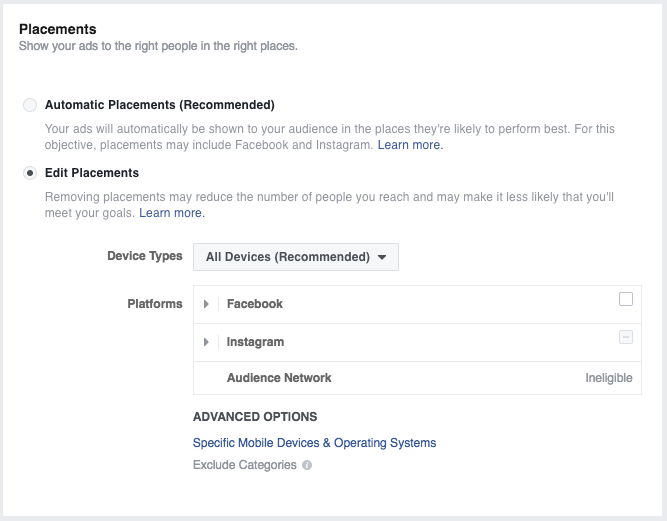 If you’ve ever set up a Facebook ad, you know the drill — setting up Instagram ads is done through Facebook’s ad platform. 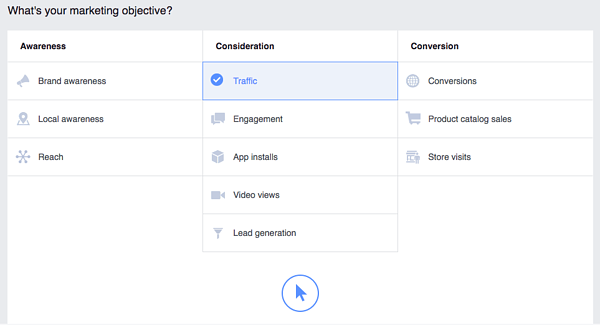 To create your ad, select a current Instagram post you’d like to boost or create a new one in Facebook Ad Manager. If you haven’t run ads through Facebook before, you’ll first need to set up an account. You’ll also need to claim your Instagram Business account to link it to your Facebook page. 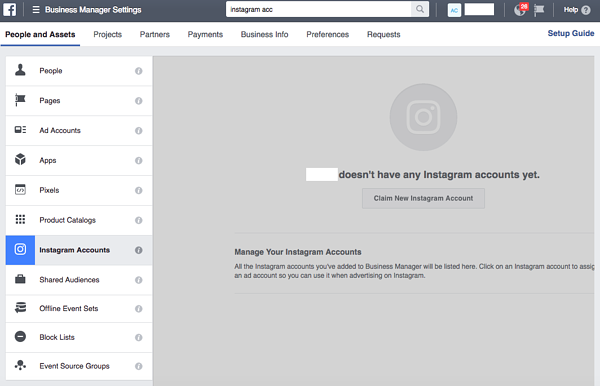 To claim your Instagram account, go to your Business Manager and, on the left side of the page, hover over the menu to click Instagram Accounts. Then click on Claim Instagram Account. Add your account information and click Next. Once you’ve selected your objective, you’ll be prompted to name your ad set. If you select the Traffic option, you’ll be prompted to select a destination for your traffic. Facebook lets you pick between a website and an application. 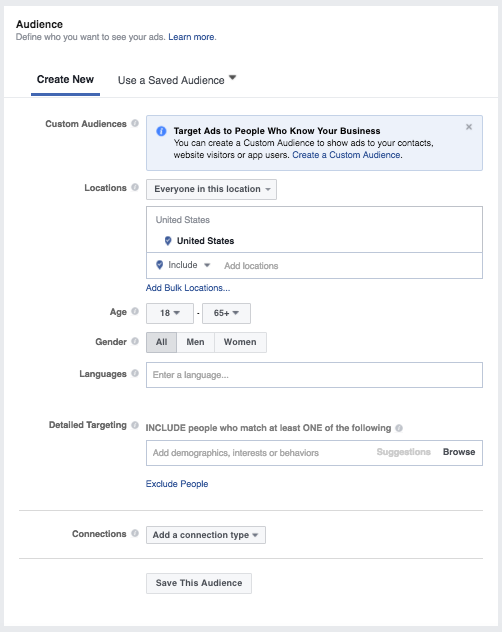 Next, target your ad with demographic and psychographic factors, such as age, gender, location, language, work, financial status, behaviors, and connections. You can also load previously-used custom audiences. Select Edit Placements under the placements options and select Instagram under the available platforms. Don’t forget this step! Otherwise, your ad will only show up on Facebook. If you only want to run your ad on Instagram, make sure that no other placements are selected. After you select Instagram as your placement, you’ll be asked to set the budget and schedule for your ad. Set a daily spend budget or a lifetime budget for the ad and indicate start and end dates for your campaign. If you don’t set dates or a lifetime budget, your ad will run indefinitely on the daily budget you allocate. 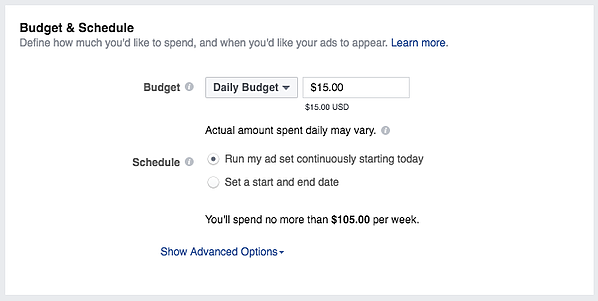 You can find more budget and scheduling options under the Advanced Options menu, which allows you to schedule your ad to run during certain hours of the day or set your ad to generate results as quickly as possible using the “Accelerated” delivery type. This option is useful for ads focused around timely events. Next, set up your ad content. You can boost an existing post or upload new content to run as your ad. Instagram allows you to create Single Image or Video Ads, Carousel Ads, and Story Ads. To maximize ad delivery, Facebook recommends using images that are at 600 x 600px for square format ads, 600 x 315px for landscape ads, and 600 x 750px for vertical ads. Facebook recommends limiting your text on the image or video thumbnail. Once your ad creative is uploaded, place your order and start running your first Instagram ad campaign! 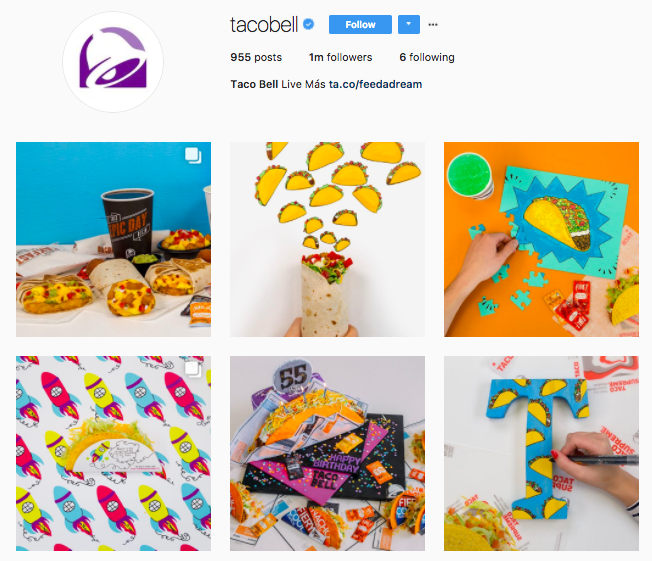 How Much Should You Spend on Instagram Ads? How much you invest in Instagram advertising campaigns should be tied to your campaign goal. This is different for every business and industry. It also applies to other goals like increased website clicks and sales. No matter your goal, it’s important to monitor and optimize your Instagram ads to make the most of your budget. With 700 million monthly active users, there’s no denying Instagram’s power and reach. What was once a simple photo sharing app has transformed into an immersive social experience that allows users to explore a company’s visual identity. Instagram users value high-quality content. Create visuals that provide your audience with interesting information or showcase your brand in a new, unique way. Optimize your content by writing entertaining captions that engage. Creating and maintaining a platform that captures your brand’s visual identity may seem intimidating, but Instagram makes it fun and easy. Follow our guide and get inspired to make the most out of your Instagram marketing strategy.